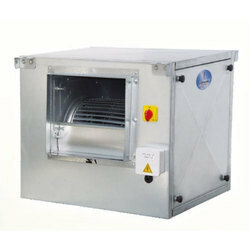 Our range of products include caryaire cdif direct drive cabinet fans. Cabinet manufactured in 20 Gauge galvanized steel complete with inlet and outlet spigots. Mounting brackets and access panel fitted as standard. Electronic speed regulator is available in all Model. High efficiency forward curved DIDW impeller with galvanized steel scroll. Squirrel cage induction motors with sealed for life bearing suitable for single phase electrical supply. Double skin models are available having 20 gauge GI outer skin with 25 mm glass wool wrapped in tissue paper and covered with 20 gauge perforated GI sheet from inside. Filter fixing arrangement is a standard feature in all model while filter is an optional item. Cabinet fans with EC Motor are also available as option. Looking for Caryaire CDIF Direct Drive Cabinet Fans ?